Koninklijke Philips N.V. (Royal Philips, commonly known as Philips) is a Dutch technology company headquartered in Amsterdam with primary divisions focused in the areas of electronics, healthcare and lighting. It was founded in Eindhoven in 1891, by Gerard Philips and his father Frederik. It is one of the largest electronics companies in the world and employs around 105,000 people across more than 60 countries. 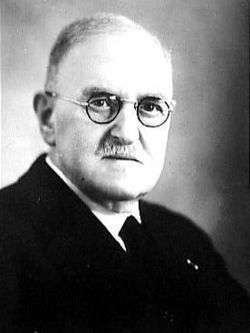 The Philips Company was founded in 1891, by Gerard Philips and his father Frederik. Frederik, a banker based in Zaltbommel, financed the purchase and setup of a modest, empty factory building in Eindhoven, where the company started the production of carbon-filament lamps and other electro-technical products in 1892. This first factory has been adapted and is used as a museum. Philips was instrumental in the revival of the Stirling engine when, in the early 1930s, the management decided that offering a low-power portable generator would assist in expanding sales of its radios into parts of the world where mains electricity was unavailable and the supply of batteries uncertain. Engineers at the company's research lab carried out a systematic comparison of various power sources and determined that the almost forgotten Stirling engine would be most suitable, citing its quiet operation (both audibly and in terms of radio interference) and ability to run on a variety of heat sources (common lamp oil – "cheap and available everywhere" – was favoured). They were also aware that, unlike steam and internal combustion engines, virtually no serious development work had been carried out on the Stirling engine for many years and asserted that modern materials and know-how should enable great improvements. Encouraged by their first experimental engine, which produced 16 W of shaft power from a bore and stroke of 30 mm × 25 mm, various development models were produced in a programme which continued throughout World War II. By the late 1940s, the 'Type 10' was ready to be handed over to Philips' subsidiary Johan de Witt in Dordrecht to be productionised and incorporated into a generator set as originally planned. The result, rated at 180/200 W electrical output from a bore and stroke of 55 mm × 27 mm, was designated MP1002CA (known as the "Bungalow set"). Production of an initial batch of 250 began in 1951, but it became clear that they could not be made at a competitive price, besides which the advent of transistor radios with their much lower power requirements meant that the original rationale for the set was disappearing. Approximately 150 of these sets were eventually produced. The first Philips shaver was introduced in the 1930s, and was simply called “The Philishave”. In the USA, it was called the “Norelco”, which remains a part of their product line today. On 9 May 1940, the Philips directors learned that the German invasion of the Netherlands was to take place the following day. Having prepared for this, Anton Philips and his son in law Frans Otten, as well as other Philips family members, fled to the United States, taking a large amount of the company capital with them. Operating from the US as the North American Philips Company, they managed to run the company throughout the war. At the same time, the company was moved (on paper) to the Netherlands Antilles to keep it out of American hands. On 6 December 1942, The British No. 2 Group RAF led an air raid which heavily damaged the Philips Radio factory in Eindhoven with few casualties among the Dutch workers and civilians. The Philips works in Eindhoven was bombed again by the RAF on 30 March 1943. Philips introduced the first combination portable radio and cassette recorder, which was marketed as the "radiorecorder", and is now better known as the boom box. Later, the cassette was used in telephone answering machines, including a special form of cassette where the tape was wound on an endless loop. The C-cassette was used as the first mass storage device for early personal computers in the 1970s and 1980s. Philips reduced the cassette size for the professional needs with the Mini-Cassette, although it would not be as successful as the Olympus Microcassette. This became the predominant dictation medium up to the advent of fully digital dictation machines. In 1991-1992, Philips along with their subsidiary Magnavox, released the Philips CD-i, a combined CD player and home video game console. It sold one million units and was discontinued in 1998 after being attacked, and harshly criticized amongst the gaming community. 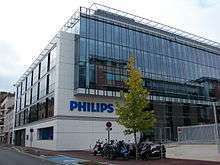 In 1997, the company officers decided to move the headquarters from Eindhoven to Amsterdam along with the corporate name change to Koninklijke Philips Electronics N.V. The move was completed in 2001. 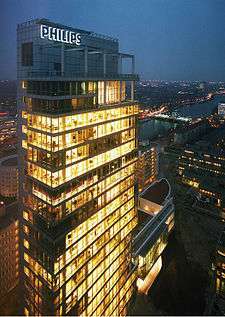 Initially, the company was housed in the Rembrandt Tower, but in 2002 they moved again, this time to the Breitner Tower. Philips Lighting, Philips Research, Philips Semiconductors (spun off as NXP in September 2006) and Philips Design, are still based in Eindhoven. Philips Healthcare is headquartered in both Best, Netherlands (near Eindhoven) and Andover, Massachusetts, United States (near Boston). In 2001, Philips acquired the Healthcare Solutions Group (HSG) based in Böblingen, Germany from Agilent Technologies for EUR 2 billion. In August 2007, Philips acquired the company Ximis, Inc. headquartered in El Paso, Texas for their Medical Informatics Division. In October 2007, it purchased a Moore Microprocessor Patent (MPP) Portfolio license from The TPL Group. 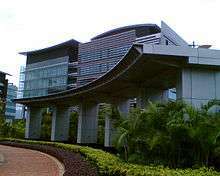 In January 2011, Philips agreed to acquire the assets of Preethi, a leading India-based kitchen appliances company. On 27 June 2011, Philips acquired Sectra Mamea AB, the mammography division of Sectra AB, together with the MicroDose brand. Because net profit slumped 85 percent in Q3 2011, Philips announced a cut of 4,500 jobs to match part of an €800 million ($1.1 billion) cost-cutting scheme to boost profits and meet its financial target. In March 2012, Philips announced its intention to sell, or demerge its television manufacturing operations to TPV Technology. On 29 January 2013, it was announced that Philips had agreed to sell its audio and video operations to the Japan-based Funai Electric for €150 million, with the audio business planned to transfer to Funai in the latter half of 2013, and the video business in 2017. As part of the transaction, Funai was to pay a regular licensing fee to Philips for the use of the Philips brand. The purchase agreement was terminated by Philips in October because of breach of contract. In 2013, Philips omitted the word "Electronics" from its name, which is now Royal Philips N.V.
On 13 November 2013, Philips unveiled its new brand line “Innovation and You” and a new design of its shield mark. The new brand positioning is cited by Philips to signify company’s evolution and emphasize that innovation is only meaningful if it is based on an understanding of people’s needs and desires. On 28 April 2014, Philips agreed to sell their Woox Innovations subsidiary (consumer electronics) to Gibson Brands for $US135 million. On February 2015, Philips acquired Volcano Corporation to strengthen its position in non-invasive surgery and imaging. Companies acquired by Philips through the years include Amperex, Magnavox, Signetics, Mullard, VLSI, Agilent Healthcare Solutions Group, Marconi Medical Systems, ADAC Laboratories, ATL Ultrasound, Sectra Mamea AB, portions of Westinghouse and the consumer electronics operations of Philco and Sylvania. Philips abandoned the Sylvania trademark which is now owned by Havells Sylvania except in Australia, Canada, Mexico, New Zealand, Puerto Rico and the USA where it is owned by Osram. Formed in November 1999 as an equal joint venture between Philips and Agilent Technologies, the light-emitting diode manufacturer Lumileds became a subsidiary of Phillips Lighting in August 2005 and a fully owned subsidiary in December 2006. An 80.1 percent stake in Lumileds was sold to Go Scale in early 2015. On 20 January 2006, Philips Electronics NV said it would buy Lifeline Systems Inc in a deal valued at $750 million, its biggest move yet to expand its consumer-health business (M). Philips Thailand was established since 1952. It is a branch of Royal Philips Electronics of the Netherlands which is a healthcare, lifestyle and lighting. 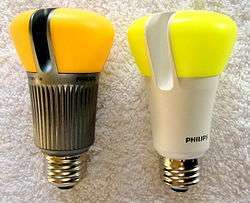 Philips started manufacturing in Thailand in 1960 with an incandescent lamp factory. Philips has diversified its production facilities to include a fluorescent lamp factory and a luminaries factory, serving Thai's and worldwide markets. In early 2008, Philips Lighting, a division of Royal Philips Electronics, opened a small engineering center in Shanghai to adapt the company's products to vehicles in Asia. Philips' Greece is headquartered in Marousi, Attica. As of 2012 Philips has no manufacturing plants in Greece, although there have been in the past. Philips Domestic Appliances Hastings: Design and Production of Electric kettles, Fan Heaters, plus former EKCO brand "Thermotube" Tubular Heaters and "Hostess" Domestic Food Warming Trolleys. Philips Mexicana SA de CV is headquartered in Mexico City. Philips Lighting has manufacturing facilities in:Monterrey, Nuevo León; Ciudad Juárez, Chihuahua; and Tijuana, Baja California. Philips Consumer Electronics has a manufacturing facility in Ciudad Juárez, Chihuahua. Philips Domestic Appliances formerly operated a large factory in the Industrial Vallejo sector of Mexico City but this was closed in 2004. Philips' Electronics North American headquarters is based in Andover, Massachusetts. Philips Lighting has its corporate office in Somerset, New Jersey, with manufacturing plants in Danville, Kentucky, Dallas, Salina, Kansas and Paris, Texas and distribution centers in Mountain Top, Pennsylvania, Ontario, California and Memphis, Tennessee. Philips Healthcare is headquartered in Andover, Massachusetts. The North American sales organization is based in Bothell, Washington. There are also manufacturing facilities in Andover, Massachusetts, Bothell, Washington, Baltimore, Maryland, Cleveland, Ohio, Foster City, California, Gainesville, Florida, Milpitas, California and Reedsville, Pennsylvania. Philips Healthcare also formerly had a factory in Knoxville, Tennessee. Philips Consumer Lifestyle has its corporate office in Stamford, Connecticut. Philips Lighting has a Color Kinetics office in Burlington, Massachusetts. Philips Research North American headquarters is in Cambridge, Massachusetts. Current activities include: Philips Healthcare (also responsible for New Zealand operations); Philips Lighting (also responsible for New Zealand operations); Philips Consumer Lifestyle (also responsible for New Zealand operations); Philips Sleep & Respiratory Care (formerly Respironics), with its ever-increasing national network of Sleepeasy Centres ; Philips Dynalite (Lighting Control systems, acquired in 2009, global design and manufacturing centre) and Philips Selecon NZ (Lighting Entertainment product design and manufacture). Philips subsidiary Philips-Duphar manufactured pharmaceuticals for human and veterinary use and products for crop protection. Duphar was sold to Solvay in 1990. In subsequent years Solvay sold off all divisions to other companies (crop protection to UniRoyal, now Chemtura, the veterinary division to Fort Dodge, a division of Wyeth, and the pharmaceutical division to Abbott Laboratories). Outside of the Netherlands, Philips sponsors and has sponsored numerous sport clubs, sport facilities and events. In November 2008 Philips renewed and extended its F1 partnership with AT&T Williams. Philips owns the naming rights to the Philips Arena in Atlanta, Georgia and to the Philips Championship, the premier basketball league in Australia, traditionally known as the National Basketball League. From 1988 to 1993 Philips was the principal sponsor of the Australian rugby league team The Balmain Tigers. 1 2 3 4 5 6 7 8 9 10 11 12 13 "Annual Report 2014". Philips. Retrieved 19 August 2012. ↑ "Lighting maker Philips warns fourth quarter earnings hurt by weakness in European market". The Washington Post. 10 January 2012. Retrieved 13 January 2012. ↑ Van, Robert. (29 January 2013) Philips Exits Consumer Electronics - The Source - WSJ. Blogs.wsj.com. Retrieved on 2013-08-16. ↑ "Philips announces decision by ICC International Court of Arbitration in Funai arbitration case". Philips Electronics. 2016-04-26. Retrieved 2016-07-23. ↑ "Philips Shavers: Innovation and You - Shaver Reviews". Shaver Reviews. 2015-05-03. Retrieved 2016-05-16. ↑ "Frits Philips celebrates 100th birthday". Philips. 15 April 2005. Retrieved 10 January 2015. ↑ "Waarom stopt Philips met zelf televisies maken?". de Volkskrant. 18 April 2011. Retrieved 18 April 2011. ↑ Snow, Blake (May 5, 2007). "The 10 Worst-Selling Consoles of All Time". GamePro.com. Archived from the original on May 8, 2007. Retrieved November 1, 2016. ↑ "Philips completes acquisition of US-based VISICU". Newscenter.philips.com. 21 February 2008. Retrieved 24 November 2012. ↑ NRC Handelsblad, 4 September 2010 Het nieuwe Philips wordt blij van een iPad-hoesje/The new Philips becomes happy from an iPad cover, Dutch original:" 'We zijn geen high-tech bedrijf meer, het gaat erom dat de technologieën introduceren die breed gedragen worden door de consument', zegt Valk [..] Consumer Lifestyle is nu zodanig ingericht dat er geen jaren meer gewerkt wordt aan uitvindingen die weinig kans van slagen hebben. [..]De Philips staf windt er geen doekjes om dat het bedrijf niet altijd voorop loopt bij de technologische ontwikkelingen in consumentengoederen." ↑ "Sectra news and press releases - Sectra and Philips sign large mammography modality acquisition deal". www.sectra.com. Retrieved 2016-04-08. ↑ "Philips to cut 4,500 jobs". 17 October 2011. ↑ Lezhnev, Sasha; Alex Hellmuth (August 2012). "Taking Conflict Out of Consumer Gadgets: Company Rankings on Conflict Minerals 2012" (PDF). Enough Project. Retrieved 17 August 2012. ↑ "Philips Electronics cuts another 2,200 jobs". 11 September 2012. 1 2 "Philips to exit hi-fis and DVD players". BBC News. 29 January 2013. Retrieved 2 February 2013. ↑ "Philips exits shrinking home entertainment business". Reuters. 29 January 2013. Retrieved 2 February 2013. ↑ Philips to take legal action against Funai. Broadbandtvnews.com (25 October 2013). Retrieved on 2013-12-09. ↑ "Paradox Engineering and Philips Lighting working together on smart city solutions.". startupticker.ch. Retrieved on September 2013. ↑ "Koninklijke Philips Electronics N.V.: Name change" (PDF). 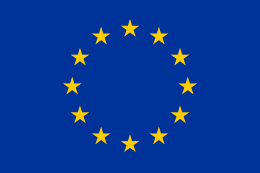 eurex. 15 May 2013. Retrieved 10 July 2013. ↑ "Philips unveils new brand direction centered around innovation and people". Retrieved 20 November 2013. ↑ "Dutch electronics giant Philips plans to split business". Retrieved 23 September 2014. ↑ PennWell Corporation (19 August 2005). "LedsMagazine.com". LedsMagazine.com. Retrieved 27 January 2011. ↑ PennWell Corporation (1 January 2007). "LedsMagazine.com". LedsMagazine.com. Retrieved 27 January 2011. ↑ "Philips electronics to buy lifeline to expand in consumer health". ↑ Nieuwhof, Marc (15 November 2010). "IP.Philips.com". IP.Philips.com. Retrieved 27 January 2011. 1 2 "(Company profile – Philips Hong Kong)". Philips.com.hk. Retrieved 27 January 2011. ↑ "Bangalore.philips.com". Bangalore.philips.com. Retrieved 24 November 2012. ↑ "philips uk - Google Maps". Maps.google.co.uk. Retrieved 24 November 2012. ↑ John Biggs, Tech Crunch. "Welcome To The Future: Polymer Vision Demos SVGA Rollable Screen." 27 May 2011. Retrieved 27 May 2011. ↑ Lewis, Gareth (15 July 2009). "50 jobs go at Polymer Vision". Southern Daily Echo. Retrieved 6 January 2016. ↑ "Products & Solutions". Philips Healthcare. Retrieved 28 January 2012. ↑ "LED 12.5W A19 Soft White 12.5W (60W) Dimmable A19". Energy-saving light bulbs. Philips. ↑ "Indoor Luminaires". Philips Lighting. Retrieved 4 March 2016. ↑ "Outdoor Luminaires". Philips Lighting. Retrieved 4 March 2016. ↑ "Lamps". Philips Lighting. Retrieved 4 March 2016. ↑ "Lighting Controls". Philips Lighting. Retrieved 27 June 2016. ↑ "Digital projection lighting". Philips Lighting. Retrieved 27 June 2016. ↑ "Horticulture". Philips Lighting. Retrieved 27 June 2016. ↑ "Solar". Philips Lighting. Retrieved 27 June 2016. ↑ "Lighting systems for office & industry". Philips Lighting. Retrieved 4 March 2016. ↑ "Retail and hospitality systems". Philips Lighting. Retrieved 4 March 2016. ↑ "Lighting systems: for public spaces". Philips Lighting. Retrieved 4 March 2016. ↑ "Choose a bulb". Philips Lighting. Retrieved 27 June 2016. ↑ "Choose a lamp". Philips Lighting. Retrieved 27 June 2016. ↑ "Philips Hue homepage". Philips Lighting. Retrieved 27 June 2016. ↑ "Philips – EcoVision4". Philips. Retrieved 7 January 2011. ↑ "Philips – Our Green Products". Philips. Retrieved 7 January 2011. ↑ Margery Conner, EE Times. "$10M L Prize goes to Philips for 60W replacement LED bulb." 3 August 2011. Retrieved 5 August 2011. ↑ "DOE Announces Philips as First Winner of the L Prize Competition". US Department of Energy. Archived from the original on 6 August 2011. Retrieved 6 August 2011. ↑ "Guide to Greener Electronics | Greenpeace International". Greenpeace.org. Retrieved 24 November 2012. ↑ "Guide to Greener Electronics – Greenpeace International". Greenpeace International. Retrieved 14 November 2011. ↑ "Philips Greenpeace International". Greenpeace International. Retrieved 7 January 2011.